You’ve seen plantain all your life. You’ve stepped on it without even noticing it. 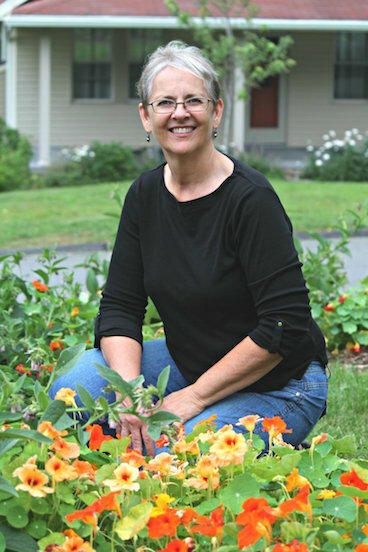 According to Katrina Blair in The Wild Wisdom of Weeds, plantain grows everywhere in the world where humans live. 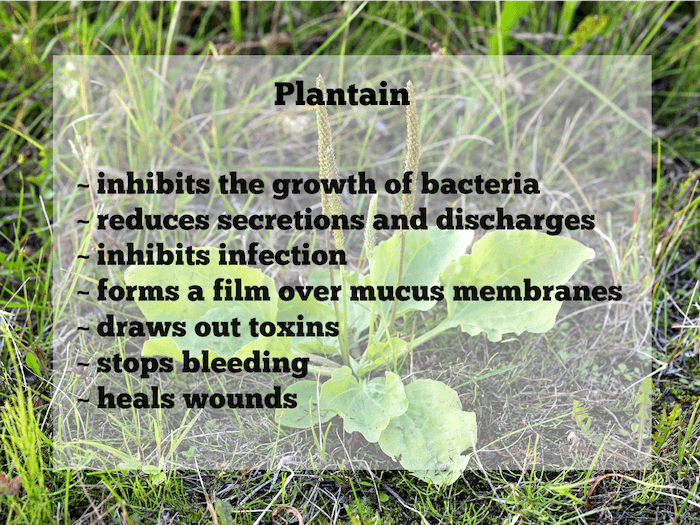 Plantain is both edible and medicinal. We’ll focus here on the medicinal properties and its amazing ability to heal skin. I’ve used it effectively to soothe eczema, severely chapped lips, and rashes, and it can help with so much more. There are 34 species of plantain but the two most common varieties are broad leaf (Plantago major) and narrow leaf (P.lanceolata). Plantain is common in areas where the ground has been compacted and can withstand being walked upon quite easily. 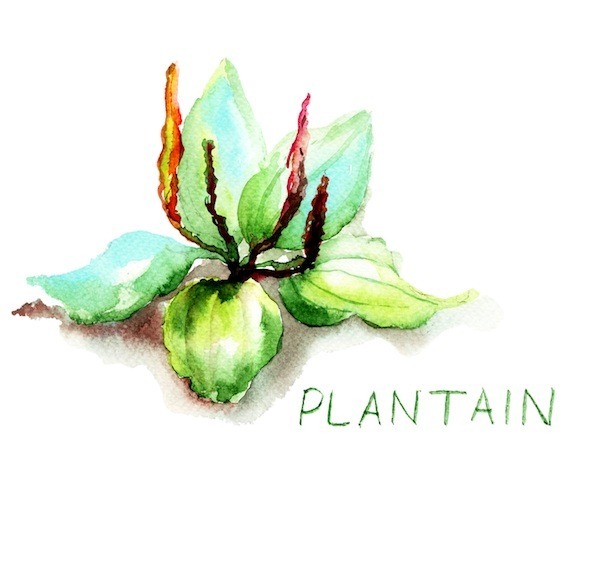 The leaves of plantain grow in a basal or rosette form at the base of the plant. Broad leaf plantain has wide, egg-shaped leaves with several veins running the length of the leaf. When harvested, you’ll notice that the leaves are stringy. Narrow leaf plantain has long leaves and resembles wide grass, and like broad leaf has long veins that run the length of the leaf. Plantain has small, greenish-white flowers, each with four petals which grow in clusters at the top of a stalk. To harvest, simply tear each leaf off at its base. 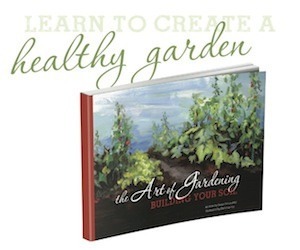 You’ll notice that the leaf will often feel like it is pulling back because of it is so fibrous and stringy. 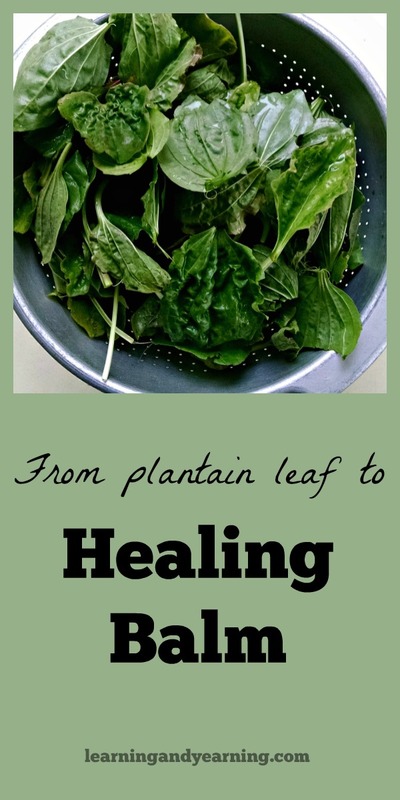 Using plantain leaf can be as simple as putting a leaf on a cut and using a bandage to keep it in place. The leaf may also be chewed to release its juices. Applied to poison ivy, this will help to bring relief. 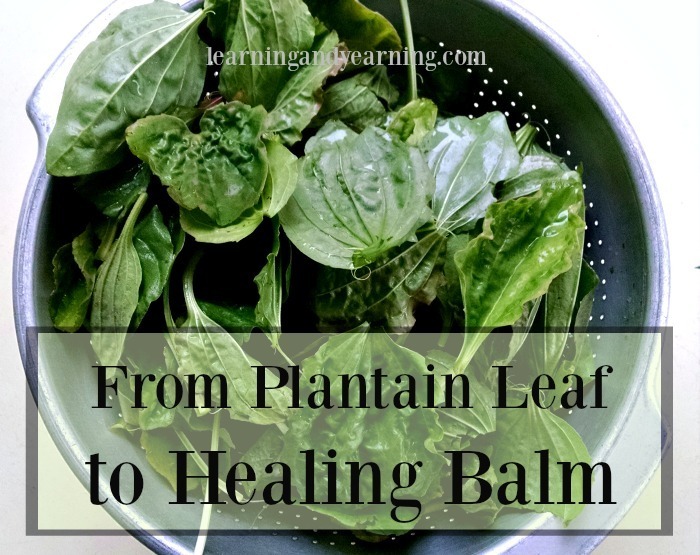 Using plantain leaf to make a balm or salve is a wonderful way to preserve the healing properties of the plant and to keep it on hand whenever needed. infuse the leaves into oil (olive oil is a great choice because it is healing and because it does not easily go rancid). Let’s go through these step by step. 1. Gather plantain leaf. The more you gather, the more balm you will be able to make, but gather at least a few cups of it. Once it is dried, the volume will decrease. 2. Carefully wash the leaves with cold water. I wash 3 times. Drain. 3. Chop the leaves which will help them to dehydrate more quickly. A food processor makes quick work of the process. 4. Spread the chopped leaves in a thin layer in your dehydrator. Dehydrate at 125° for several hours until dry. Alternately, dry them in your oven at its lowest setting. 5. Place the dried leaves in a mason or other heat-resistant jar and cover completely with olive oil. Put the lid on your jar. 6. Allow the plantain to infuse into the olive oil by allowing it to sit at room temperature for 1 - 2 weeks. Alternately, place the jar into a pot of water. Set this on the stove on the lowest setting possible and infuse for several hours. Longer is better. 7. Line a strainer with cheese cloth and strain the plantain leaf out of the olive oil. 8. Measure the olive oil and return to the mason jar. For every cup of oil, add 1/4 cup of grated beeswax, or beeswax pastilles. Place the jar into a pot of water and heat on a very low setting. Stir until the beeswax has melted. Allow to cool. 9. If the consistency of the balm is too soft, re-melt and add a little more beeswax. If the consistency is too hard, re-melt and add a little more oil. 10. Pour the melted balm into tins or small glass jars. 11. Store the balm in a cool, dark place. Is it a Weed, or is it an Herbal Remedy? What is the reason behind drying the leaves? Is it okay to use fresh leaves to infuse the oil? Thanks in advance! I have tons of broadleaf in my back yard and am excited to find more uses for it. Hi Jen, because oil and water don’t mix, the moisture in the leaf can cause the balm to mold so it’s best to dry the herb first. Thanks for stopping by! Excellent! Why didn’t I think of that? Thank you so much! I have a bunch drying now. Cannot wait to try it out. well…..i did it! my FIRST FORAGING CLASS with Susan! it was a hot day….i could have skipped it….SO VERY glad i went! she is smart and fun and relaxed and open for questions! never too old or too young to learn some new things! Lemon Balm….right along our path…brought some home for refreshing TEA! hers was yummy! and PLANTAIN….NOT a weed like i thot! we helped with the process of making a balm for helping heal all kinds of skins issues! already tried it on my spot of poison ivy (which we also identified in it’s various location) so….THANK YOU Susan Vinskofski! Hi Sylvia, the balm may be stored for several months unrefrigerated, or a year in the refrigerator. I’ve never used coconut oil, but that should work just fine. I’ve gathered some plantain from my garden this morning to dry and give this a try. Thanks for sharing. I make this and pour it into tubes like chapstick. Just right for a pocket when you are outside working ( I have a farm), or foraging, berry picking, etc. in case of bee sting, scrape, or scratch. I also add some vitamin E or tea tree oil to preserve it. These make nice quick gifts for friends. This particular recipe would be just a little soft for that, but adding a little more beeswax would make it work perfectly. Great idea!!! Does it matter if you use plantago major or plantago minor? Do they both have the same healing properties? Hi Vickie, both are equally medicinal!